← And the results of the Aurealis Awards are in! 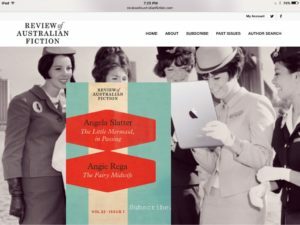 Over at the Review of Australian Fiction, Angie Rega and I have stories in the latest issue! Mine is “The Little Mermaid, in Passing” (which took some inspiration from Mike Mignola’s “The Third Wish” and Damien Angelica Walters’ “Sing Me Your Scars”). Angie’s is the very dark “The Fairy Midwife”! This entry was posted in fairy tales, News and tagged angela slatter, angie rega, Damien Angelica Walters, fairy tales, hellboy, Mike Mignola, Review of Australian Fiction. Bookmark the permalink.